Another year passed, another year older, another year wiser (yeah right...). 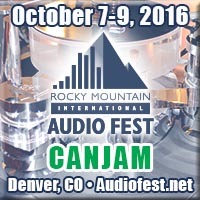 Early October I will again attend the Rocky Mountain Audio Fest. This year I have to skip Burning Amp and the LA AES convention. I had to make a choice, and RMAF it is. And it has nothing to do with the fact that my buddy SY will join me in Denver. Of course not. Seriously, RMAF hits exacttly that great combination of commercial audio demo's, technical presentations and enough diy-ers to fill several bars with. Join me there this year! The European Triode festival will be held for the last time in Berlin, from 20 to 23 November. I have a few items I will take, a pair of full range speakers I have left from my SpeakerCamp event. Also a power amp build up from paralleled and bridged AD815 dual power opamps that are really meant for (A)DSL duty. But with half an amp output capability, 6 pairs deliver about 35 Watts of very high quality audio power. All driven by my latest toy, a Shanling DR2.1 streamer/DAC. I am so glad I am one of the lucky few to attend the limited attention event! Keep track of what is happening at www.triodefest.net . Ready for Rocky Mountain Audio Fest ? Decide that the AES could wait for the next one in Spring 2015. I will be present and bring copies of all Linear Audio Volumes at booth # 14 in the lobby of the venue. As last year I also represent audioXpress so come by for any free magazines and info! My booth is just behind the Registration Desk. Hope to see you all again! First, on 6 October, will be Burning Amp in San Francisco at Fort Mason on the bay. I will have something to show & demo this year! A Smyth A8 Realiser driving a Stax headphone. A truly revolutionary device! But also looking forward to see and hear many excellent diy creations, as always! 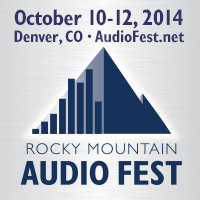 The weekend after that I'll be at the 10th Rocky Mountain Audio Fest in Denver. I will be sharing a booth with Elektor International media, the new owners of audioXpress, and they will have some pleasant surprises in store for readers, so please stop by for a chat! We'll be in the lobby. And yes, I'll bring the Realiser along as well. To make it a round trio, the weekend after THAT (actually 17-20 October) there's the 135th AES convention in New York. Again I will share a booth with EIM and that occasion will also be the launch of the new, revamped and enlarged audioXpress! So whichever show you'll go this year do make a point of stopping by for a chat, I'd love to get to know you and hear any comments or suggestions you might have for Linear Audio and related stuff. See you soon! It is with sadness that I must report that Edward T. Dell Jr. passed away 25 February 2013, just a few weeks after his 90st birthday. Ed Dell founded The Audio Amateur in 1970 as a quarterly audio diy magazine. After a continuous growth to a large circulation as a monthly mag, Ed added two sister magazines in the 90ies, namely Glass Audio and Speaker Builder. After the turn of the century, forced by increased overhead and mailing costs, all publications were absorbed in the newly-named AudioXpress, follwed by an online version joining the continued printed version. Throughout the years, Ed had maintained friendly and professional ties to the Netherlands-based Elektor diy electronics magazine. 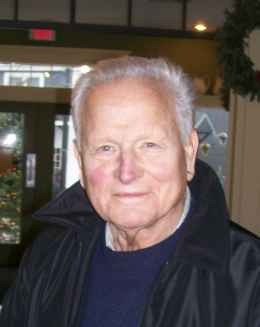 Elektor USA acquired Audio Amateur Inc. in 2011, allowing Ed to - reluctantly - retire at age 88. I published my first article in TAA in 1974 or 75, and Ed has always be a mentor and motivator for me to develop my writing skills. His encouragement and trust ultimately led to my own publishing adventure with Linear Audio. Besides a mentor, Ed became a personal friend and I will miss him dearly. I'm getting ready for the European Triode Festival, to be held in Berlin, Germany on the weekend of 22 to 25 November. After attending for several years, this time I decided to take a complete system with me, to demo to the participants. Thanks to my friend Leo who provided his large van, I can transport my speaker system and amplifiers. Not strictly triode-powered, but hopefully with Bob Cordell's power amp from his Vol 2 article. Exciting and scary! I had a great Rocky Mountain Audio Fest, meeting lots of interesting and friendly audio afficionado's in The Mile High City. Had Bob Cordell's VinylTrak on display, which generated a lot of interest. Next weekend, 26 to 29 October 2012, I will be at the San Francisco AES convention, again sharing a booth with Elektor USA and AudioXpress, and again having VinylTrak on display. During the same weekend the Burning Amp Festival will be held at SF's Fort Mason, on Sunday the 28th. So I will probably exchange the AES for BAF at that day. If you are at either of those events, please make sure to pass by my little stand for a chat! I really enjoy meeting you and chatting about audio and related stuff, and I also will have a limited number of Linear Audio bookzines available.